Image caption UN observers suspended patrols because of the "significant risk to their lives"
The United Nations has called an end to its military observer mission in Syria, days before its mandate expired. "The conditions to continue [the mission] were not filled," France's UN ambassador Gerard Araud said after a Security Council meeting. The UN mission had been part of envoy Kofi Annan's six-point peace plan. But continued violence made the observers' mission increasingly difficult. A bomb exploded close to their hotel in Damascus on Wednesday. The observers' patrols were suspended in mid-June because of the "significant risk to their lives" and diplomats said the conditions for renewing their mandate - a halt to the use of heavy weapons and a reduction in violence - had not been met. "So the mission will come to an end at midnight on Sunday," said Mr Araud, the current president of the Security Council. Russia warned earlier that pulling out of Syria would have "serious negative consequences" for the region. Moscow's UN envoy Vitaly Churkin said Russia, which has vetoed three UN Security Council resolutions on Syria, wanted the UN to make an international appeal for the Syrian conflict to end. Mr Annan resigned as UN-Arab League envoy to Syria a fortnight ago, complaining of a "clear lack of unity" in the Security Council. UN officials are hoping that veteran envoy Lakhdar Brahimi, who has previously served in Afghanistan and Iraq, will take over as international mediator, but with a different mandate. Although the 101 remaining military observers will leave Damascus over the next eight days, a civilian liaison office is due to remain. An estimated 20 to 30 people would staff the liaison office, UN deputy peacekeeping chief Edmond Mulet said. "The situation on the ground is extremely difficult. But the fact that it's difficult doesn't mean we shouldn't face that challenge of trying to open those political spaces in the future," he told reporters at the UN. Mr Churkin said Russia had called for a meeting on Friday of Security Council members as well as representatives from Saudi Arabia and Iran to discuss the crisis. The 300-member UN Supervision Mission in Syria (Unsmis) was set up in April, initially under a 90-day mandate, to monitor a halt to violence and the implementation of Kofi Annan's plan. When the 90 days expired, its mandate was extended by a further 30 days in July, despite patrols coming to an end on 16 June because of the increasing bloodshed throughout Syria. The patrols had become increasingly risky, as monitors faced stone-throwing crowds and gunfire. According to UN figures, more than 18,000 lives have been lost since the uprising began in March 2011. 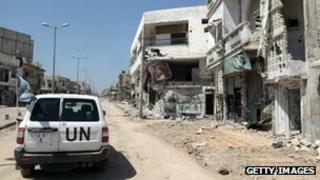 Activists said another 200 people were killed in violence across Syria on Thursday. At least 36 deaths were reported when a queue of people was hit by shells outside a bakery in the Qadi Askar area of eastern Aleppo. Unverified video footage emerged on activist websites showing several bodies lying in the street as local people rushed to take the wounded away for medical treatment. Details are still emerging of an attack by warplanes on Wednesday on a rebel-held town some 30 miles north of Aleppo and close to the Turkish border. An estimated 20 homes collapsed in the attack and at least 40 people were killed. More than 80 of the wounded were treated in a Turkish hospital where at least 13 of them died. The extent of casualties cannot be confirmed as the movements of international journalists are severely restricted in Syria.